What a perfect call at the beginning of last week, especially from some one who is negative on US corporate credit & stocks! David Rosenberg‏@EconguyRosieAug 20 – Investors start the week in a pretty good mood. 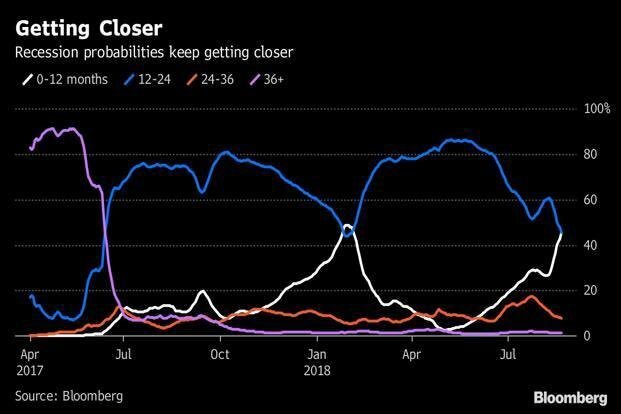 The bet is that Turkey’s woes won’t spread; that China blinked just in time; and that Powell will sound dovish this Friday. Three for three – Kudos to Rosie. 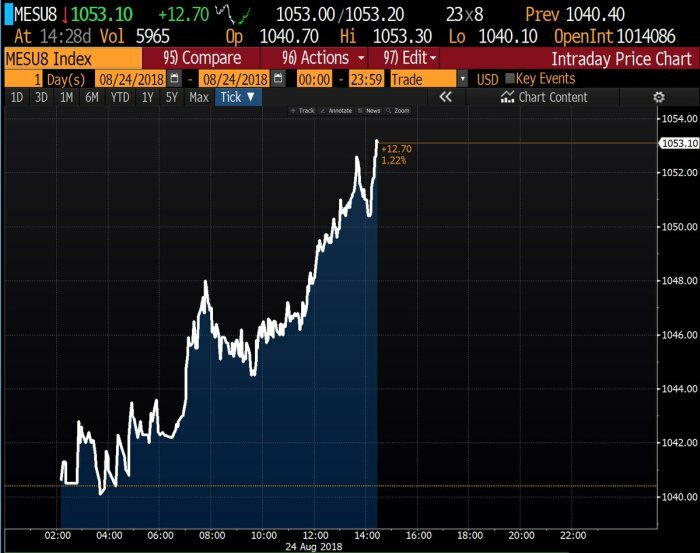 Look what the decidedly rosy week did – S&P up 88 bps; Nasdaq up 1.7%, Russell 2000 up 1.9%, EEM up 2.9%; Rates down & TLT up 1.4%, Dollar down 1%, Oil up 4% and Gold, yes Gold, up 1.7%. Man, are we in 2006-2007 or what? The one missing ingredient – no FinTV anchor saying “global liquidity, global growth“! David Rosenberg‏@EconguyRosieAug 20 –Some pretty big extremes in terms of positioning from the latest CFTC data. Record net shorts on the 10-year note. Gold speculators have turned net bearish for the 1st time in 17 yrs. Net longs on the DXY have swelled 8-fold since May and remain near record highs for the SPX. That’s positive for global liquidity, right? 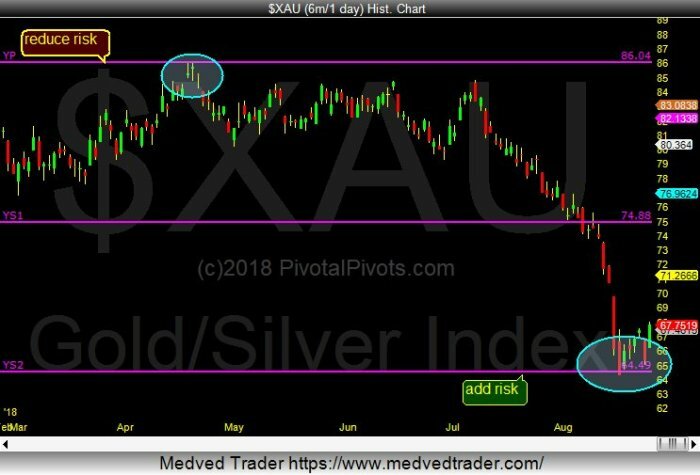 jeroen blokland‏Verified account@jsblokland – EM future likes#Fed‘s #Bullard! And that is a big positive for global growth, right? Fedhead Bullard also deserves credit because he said in the morning that he doesn’t see the need to raise rates in 2018 and that inflation is not a worry. If it does rise, then the Fed can act quickly. So rates will be stable to down, Dollar will be stable to down & inflation is tame – remember Larry Fink who wondered if this year will prove to be 1994 instead of 2000 or 2007? Remember the Orange County, CA bankruptcy, the Mexico crisis, the carnage in Treasury bonds in Q2 & Q3 of 1994? The 1994 stock market meandered through it all without going down. Then the Treasury bonds rallied like crazy in Q4 1994 because inflation had been killed by Greenspan and the stock market took off. But remember what made 1994 the 1994 we all remember – easing of rates by Greenspan in 1995 after the Treasury bond market’s rocket-like rally in Q4 1994. We recall Jim Grant saying that more than a 1/3rd of the 1995 entire bond rally was achieved in Q4 1994. Will Chairman Powell act like Greenspan did in 1990s? He didn’t promise but he did praise the actions of Chairman Greenspan in his Jackson Hole speech on Friday. So what might make Chairman Powell begin to lower rates? If the global slowdown begins to affect the US economy faster than any one expects is one reason. Second is what happened in Q4 1994. Gundlach has already talked about a big short squeeze of the all-time high shorts in 10-year Treasuries. On Friday, a bond trader talked about the 10-year yield possibly dropping to 2.34% before year-end. Her point – in every year for the past 6 years, the 10-year yield has touched 2.34% except this year. So possibly it might get to 2.34% this year as well. Forget 2.34%. Just a fall to 2.6% in the 10-year yield could do the trick. The 10-2 year yield spread has dropped to 19 bps. What if this spread falls by another 20 bps? Then you have yield curve inversion. What about the mid range spreads? The 5-3 year spread is only 4 bps and the 3-2 year spread is only 5 bps. Given the enormous size of shorts in the 5-year Treasury, how fast could the 5-3, 3-2 & even 5-2 year spreads invert? Rick Santelli has said the first curve to invert would be the 10-7 year curve which is only 4 bps. Heck, these 4-5 bps spreads could invert after the September FOMC meeting in 3 weeks. It might happen sooner if the US data comes in weak prior to the September FOMC meeting. Does any one think Chairman Powell would remain hawkish in the face of an inversion in sections of the Treasury yield curve? We don’t. We have seen what nature has done this year and as we write this, Hawaii is experiencing flash floods. Remember Complexity Theory argues financial markets & climate are both complex systems that act similarly. So wonder what might happen if we see a bonfire of the shorts in rates or a flood that wipes out longs in currencies. What made Rosenberg say that? Our bet is that Chairman Powell knows it too. We don’t think he wants to go the way of Greenspan in 2000 or Bernanke in 2007 – meaning he doesn’t want to go down in history as the Fed Chairman who created a 3rd massive recession in the country. And like President Trump & unlike Greenspan-Bernanke, Chairman Powell has been an investor, a private equity investor who knows what happens when liquidity gets too squeezed & bubbles go bust. So we think the big question is – Does corporate credit blow up before Chairman Powell changes course or does he change course before corporate credit blows up? And how does the November 2018 election play into that? Ian bremmer‏Verified account@ianbremmer Tue Aug 21 – GOP: The President must be impeached! Dems: Lying about affairs isn’t impeachable! The economy is awesome! Oh wait. Four major indices made new all-time highs on Friday including the all important S&P 500. The S&P took more than six months to make a new high. Does that mean anything? Ryan Detrick, CMT‏@RyanDetrick – The S&P 500 hasn’t closed at a new all-time high for 145 trading days. Since ’50, it has done this only 17 times. After a new high is finally made? A year later it was higher 16 of those times. In other words, an eventual new high could be a good sign the bull still has legs. SentimenTrader‏Verified account@sentimentrader– When $SPY has reached a high on other lazy August Fridays during this bull market, it has struggled to hold the momentum. That’s fine. Small ups & downs are a part of every journey. Of course, a deep valley is a very different thing. 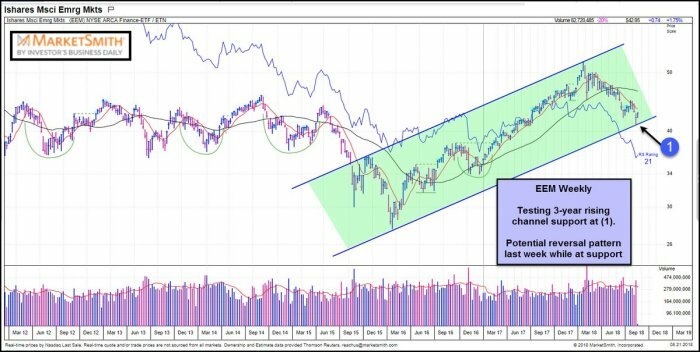 Lawrence McMillan of Option Strategist has wondered whether the dreaded double top could happen again. 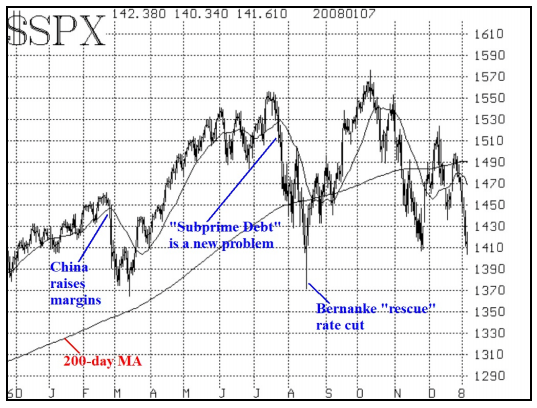 To that end, he has discussed the double top of 2000 & the double top of 2007 via charts. 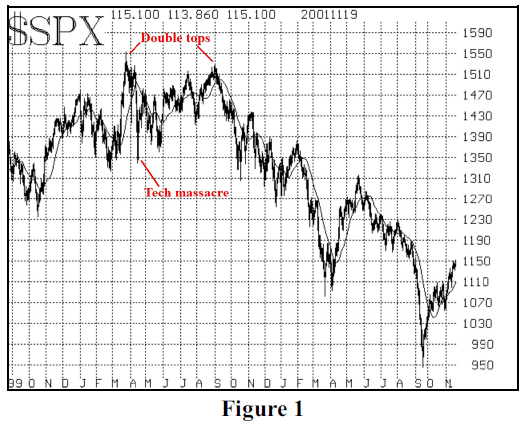 The first top was March 2000 followed by a tech massacre in April 2000. The market recovered & “pushed back toward the all-time highs at 1550, nearly reaching them in August 2000.” Then the deluge. That is why it is important for the S&P to decisively trade & close above this Friday’s close. And that might need President Trump’s win in November ideally with Chairman Powell’s smart easing of liquidity before the election. The Dollar may not be singularly relevant to the direction of the S&P 500. 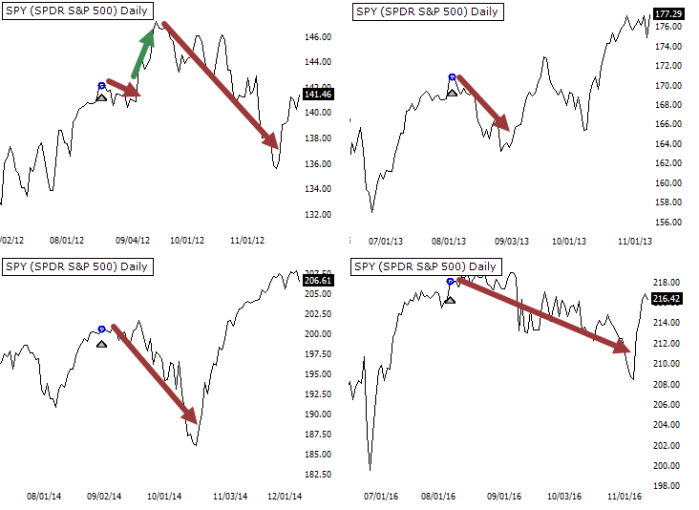 But it will prove important to sector performance within the S&P 500. In contrast, the direction of the Dollar is crucial, in our opinion, to other asset classes like Emerging Markets & Precious Metals. As readers know, we stopped covering Gold & Gold Miners several weeks ago because we couldn’t find any one who was consistently right. We make an exception today, mainly in honor of Chairman Powell’s speech on Friday. 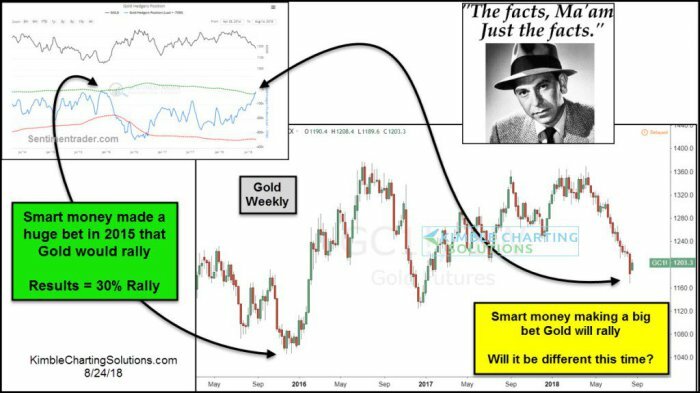 Smart money hedgers have established a big bet that Gold will rally (same size bet as 2015). 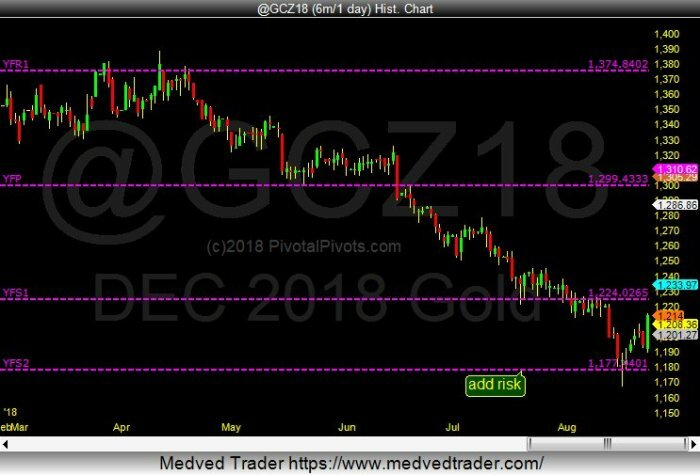 This is taking place as bullish sentiment on Gold is hitting one of the lowest levels in years (18% bulls). That seems long term. Any one suggesting short term reversal? 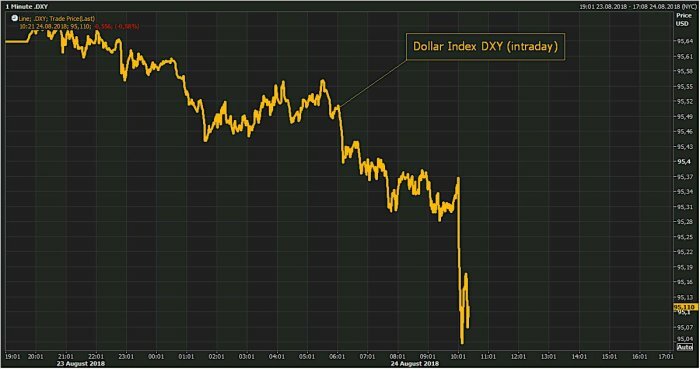 All this assumes that the action in the U.S. Dollar on Friday was not a trap. Prior to its earnings on July 16, we introduced, in Section 7 of our article on July 14, the premier of Netflix India originals titled Sacred Games. That series received 100% Rotten Tomatoes Rating. It was as the review in the New Republic said “a sophisticated move in Netflix’s quest to net every eyeball on earth“. Netflix India has huge plans & if their biggest investment succeeds then its market share in India could soar. How huge? Netflix India‏Verified account @NetflixIndia Aug 2 – You witnessed the Mahishmati Empire in all its glory. Now witness its rise. Baahubali: Before the Beginning coming soon. Some readers might recall that we wrote about the film Baahubali the beginning and its sequel Baahubali the conclusion in detail in these articles. Both were spectacular films in scale, quality & story. The sequel Baahubali the conclusion is the biggest blockbuster ever in the Indian Film Industry. Now Netflix India is launching the prequel Baahubali before the beginning with the same team that made the Baahubali movies. It will probably be a lot more expensive than anything Netflix has done in India or in many places in the world. If the Netflix prequel is even 25% as spectacular as the two Baahubali films, Netflix India could soar in its market share. And this expansion is happening just as 4G is getting introduced in India. And traffic jams are forcing people to watch their favorite entertainment at home & on smart phones. Netflix is entering the broadband entertainment market in India at its launch just as Fox launched its Star Network in India as Television was being launched. We all saw the price Disney paid to buy Fox, principally for the Star Network in India & its entertainment & Cricket franchise. So imagine what a successful Netflix India franchise could be worth in 10-20 years. The Netflix commitment goes to demonstrate what we have been saying for some time – a large presence in India is a must for every global entertainment company. If that is true for today’s India with 600 million people in poverty, how true would that be in 10-20 years? Readers, both Baahubali the beginning & its sequel Baahubali the conclusion are on Netflix (with excellent subtitles). Watch them. Netflix isn’t dumb to bet so much on the Baahubali franchise. How simple is it to say “Raajan”? But for some reason, “professor” Steve Liesman keeps butchering it. There are a few Indian Americans in CNBC. Why doesn’t he ask them? Or he could ask Sara Eisen who pronounces it perfectly. We just don’t get it. Steve Liesman is a good guy, we think. We really don’t think there is any racist tinge to him. Then why the adamant refusal to correctly pronounce the name of an Indian monetary theorist whom he obviously respects? Then there is our jinx about CNBC. Every time we feel positive about a CNBC anchor, that anchor goes out and does something really bad. We have been impressed with the diligently accurate pronunciations of Indian names by Sara Eisen. Then she did something that shocked us. On Friday afternoon, Sara used the adjective “lame” to suggest an argument was weak & pathetic. And we had assumed using physical disabilities in a pejorative sense to ridicule others was a thing of the past. Sara should look at photos of US veterans with disabled legs because of their service to the nation in Iraq, Afghanistan & other remote parts of the world. And that too at a fraction of the money Sara makes as a CNBC anchor. Sara’s colleague, Michelle Caruso Cabrera, once termed herself & her anchor colleagues as “narcissist”. That is too self-serving, we think. May be every TV anchor eventually gets infected with a condition we call Anchoritis – a feeling that TV Anchors are above every one else, that they have a unique station in society that no one else has. May be this Anchoritis condition is behind Steve Liesman’s refusal to pronounce “Raajan” and Sara Eisen’s pejorative use of “lame”. The big question is whether Mark Hoffman & Nik Deogun foster such Anchoritis at CNBC or will they act to cure their network of it.